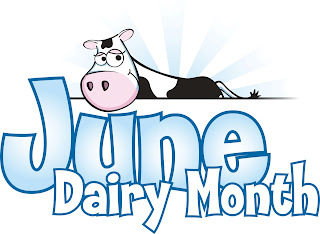 What a better way to say goodbye to the chilly, wet spring that most of the country experienced than by jumping into June—Dairy Month—with some great research on profit margins. As Americans become increasingly concerned about the negative health effects of certain foods or food ingredients, manufacturers are introducing a greater variety of healthier products. This includes lower-sugar flavored milks and reduced-fat cultured products. This move has expanded profit margins throughout the food industry because health-conscious consumers are generally willing to pay more for food that they believe is healthy for them. (Think Greek yogurt.) In particular, large companies that have been providing Americans with foods for years have established brand loyalty, so when they introduce healthier, more-expensive products, they typically do not experience significant declines in demand for their products because people view them as high-quality brands, according to a recent report from IBISWorld Inc. As such, these companies can realize higher profit margins than companies that do not have well-established brands. Volatility, in turn, leaves processors less able to anticipate cost increases. They will often pass these costs on to consumers in the form of higher product prices, or, as in the case of ice cream, by reducing package size. Although this move does not bode well for consumers, many will still pay the higher prices, or accept the smaller package, especially for foods that are staples in their diets. Processors end up benefiting because the higher input prices aren’t eating into their profit margins, while demand from consumers stays steady. During the five years to 2018, the price of corn is anticipated to decline at an annualized rate of 2.6% to $5.71 per bushel, reversing its 6.7% annualized ascent from the past five years. Consequently, processors will be able to increase the volume of products they manufacture and price them more favorably for consumers. Declines in the price of corn will also make the price of feed less volatile during the next five years since corn is a primary input into feed for livestock. And the price of sugar is also an important commodity in several of the most profitable food-producing industries, including ice cream. It, too, is expected to be less volatile during the next five years compared to the past five. 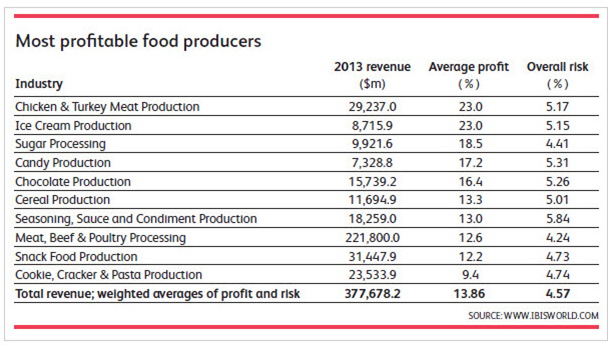 The top-10 most profitable food industries have a risk rating ranging from low to medium-high in 2013, with an average weighted overall risk score of 4.57 out of 9 (with 9 representing the highest risk). The primary drivers affecting risk in these industries include demand from supermarkets and grocery stores and the price of commodities. 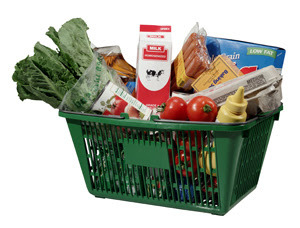 Because consumers’ incomes are improving, they will be more likely to purchase goods from supermarkets and grocery stores, including discretionary goods, which is driving demand for food manufacturers. Food processors aim to strike a balance between providing Americans with the food that they love at a reasonable price and maximizing company profitability. During the next five years, profit margins in these already-profitable food product industries are expected to expand as commodity prices become less volatile and operators cut costs associated with production. In addition, if prices do rise, they will be better able to pass off cost increases in the form of higher product prices to consumers because disposable incomes are improving in line with the economy. In particular, larger and well-established companies produce brands that millions of Americans are familiar with and loyal to. Still, Americans will look to their favorite brands to introduce healthier food products as they strive to live healthier lives. Processors that introduce and advertise healthier products are likely to be rewarded with greater sales, thus benefiting margins further. Thanks to IBISWorld Inc., for sharing this report. For a printable PDF of the report, click HERE. 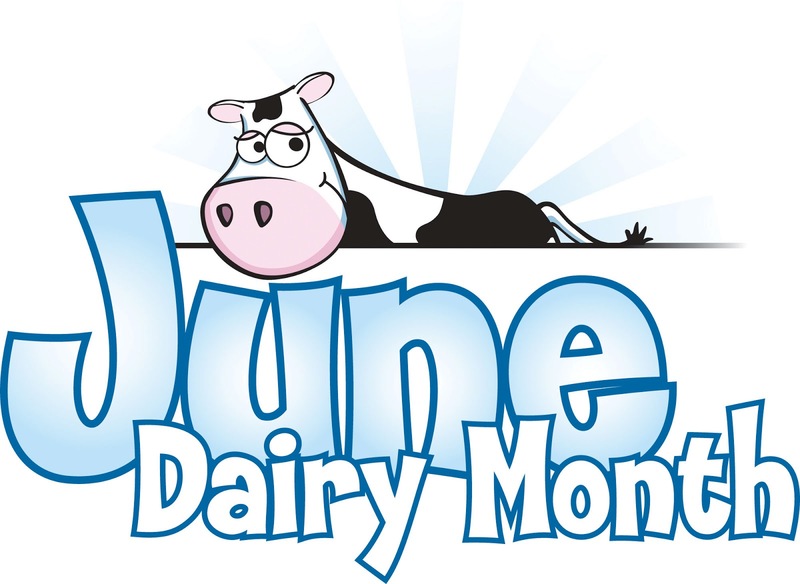 With that said, June is the perfect month to remind consumers that dairy foods are inherently healthy. 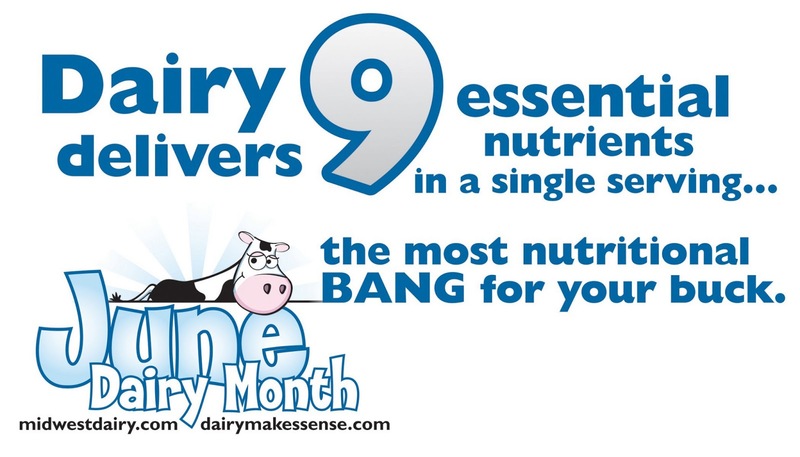 Milk and other dairy foods provide nine essential nutrients. 1. Calcium: Helps build and maintain healthy bones and teeth. 2. Potassium: Helps to regulate the body’s fluid balance and maintain normal blood pressure, and it’s needed for muscle activity. 3. Phosphorus: Helps strengthen bones and generate energy in the body’s cells. 4. Protein: The protein in milk, yogurt and cheese builds and repairs muscle tissue, and serves as a source of energy and satiety. 5. Vitamin D: Promotes the absorption of calcium and enhances bone strength. 6. Vitamin A: Helps maintain normal vision and skin, and is important for bone growth. 7. Vitamin B-12: Helps maintain healthy red blood cells and nerve cells. 8. Riboflavin: Helps convert food into energy that the body can use and it’s important for normal eyesight and healthy skin. 9. Niacin: Helps bodies digest carbohydrates and fatty acids. Further, according to the Midwest Dairy Council, Dairy Month is a perfect time to celebrate dairy farmers’ commitment to healthy people, healthy communities and a healthy planet! One of the greatest challenges of the next generation will be providing nutritious, affordable food to a global population expected to grow to nine billion by 2050 – while using fewer resources. Dairy is part of the solution. Not only are dairy products rich in nutrients, they are also being produced using fewer resources, helping to foster healthy people, healthy communities and a healthy planet. At 11:59pm ET on May 21, 2013, the comment period ended on one of the most controversial food-related FDA petitions of the 21st century. The regulatory agency had received 40,649 comments on the citizen’s petition (FDA-2009-P-0147) that was filed nearly four years ago by the International Dairy Foods Association (IDFA) and the National Milk Producers Federation to change the standard of identity for fluid milk to include approved zero-calorie sweeteners as an option in sweetened products. You can view the petition and comments HERE. The petition, submitted in 2009, was in direct response to the push from federal agencies and consumer groups for lower-calorie foods and beverages to combat increases in childhood obesity. The dairy industry responded by asking for a change in the standard of identity that would provide more options for formulating lower-calorie, less-sugar flavored milk. In February 2013, FDA finally published the petition in the Federal Register along with the agency’s request for public comment. Since, many consumer activist groups created confusion through their own interpretation of the petition, to the point that FDA felt inclined to reach out to consumers and clarify the intent of the petition in a Federal Register notice on April 15, 2013. You can view this outreach HERE. Here’s one example of the misconstrued message. From April 29 to May 21 (the last day to comment on the petition), the consumer watchdog organization SumOfUs.org placed ads on 15 buses in the DC metro system urging FDA to reject unlabeled aspartame in milk. The buses stopped directly in front of FDA, at a special stop provided by DC metro for FDA employees. And, according to the organization, more than 116,000 consumers had signed its petition urging FDA to reject the petition. But here’s the deal, the petition is not about aspartame! It’s not even about ingredient disclosure. It is about nutrient content claims. Nevertheless, this group was loud. Check out the ads HERE. In its comments to FDA, the Academy suggests that the current standard of flavored milk is effective in encouraging milk consumption by school-aged children. The letter states: Flavored milk has been shown to be an effective tool in encouraging milk consumption by school-aged children; studies have demonstrated that school-aged children who drink flavored milk meet more of their nutrient needs, do not consume more added sugar, fat or calories, and are similar in weight to non-milk drinkers. Flavored milk is not a major source of added sugars for children. (Major sources include soda, fruit drinks, grain desserts, candy, dairy desserts and cold cereals). Read the Academy’s comments to Comments to the FDA. On Thursday morning, May 23, a mere 33 ½ hours after the comment period ended, the person in charge of reviewing those 40,649 comments addressed attendees at IDFA’s Milk & Cultured Dairy Conference in Indianapolis. 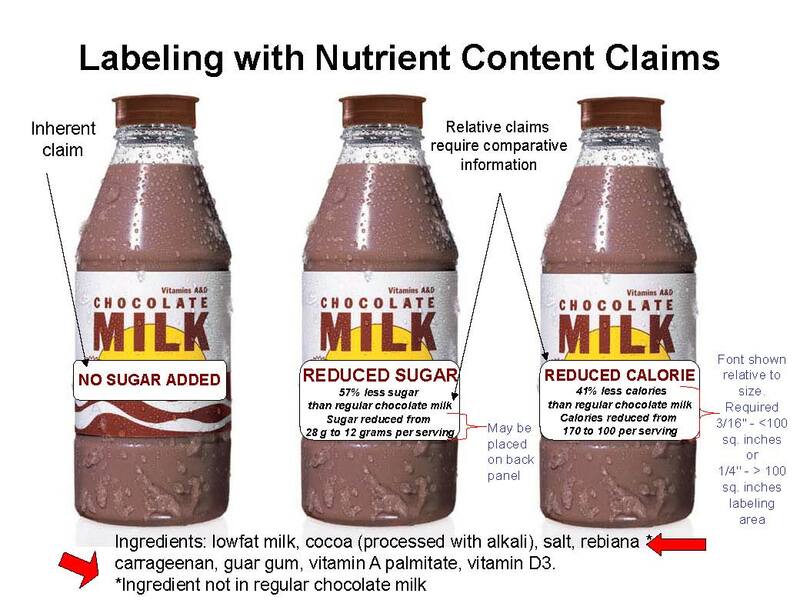 “FDA will be evaluating the comments received related to the needed and appropriateness of the amendments the petition requested,” said Daniel Reese, food labeling and standards staff-Office of Nutrition, Labeling and Dietary Supplements at FDA. In other words, the next steps are to filter out the comments based solely on emotion and unrelated noise, and review the comments that identify the pros and cons to the petition. “The petition really wants to level the playing field so that flavored milk can better compete with other lower-calorie beverages,” according to Peggy Armstrong, vice president of communications, IDFA. She explains that the current standard requires processors to use nutrient content claims, such as “reduced-calorie,” on the front labels of flavored milk made with non-nutritive sweeteners. There are requirements to be able to call a product…any product…reduced calorie, and when it comes to flavored milk, meeting those requirements can be challenging. 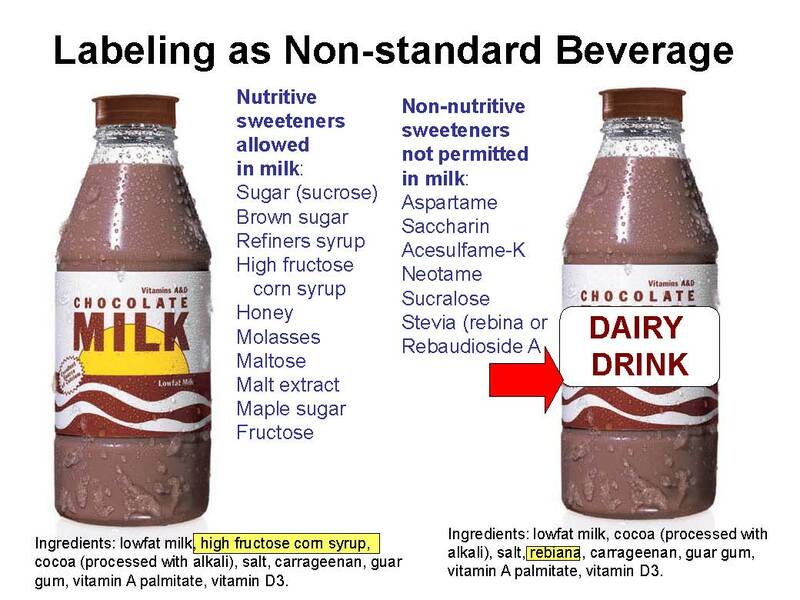 If those requirements are not met (see graphics), then the product would be a non-standardized beverage and could not be called milk. Dairy drink would be an option. Confusing? It can be, which is why there has been so much discussion on the petition. For more background on sweetening flavored milk, please refer to an article I recently wrote for Food Business News. It can be viewed HERE. The fact is, allowing milk processors to use any safe and suitable sweetener in flavored milk and still label it milk would help to stem the drop in consumption, while promoting healthy eating habits that will last a lifetime. And unfortunately, one very important issue is being overlooked through all this controversy, and that is how to get kids to drink their milk. Research shows that children prefer flavored milk over plain white milk. Flavored milk requires sweetening. There are many caloric sweetening options, and a growing number of no- and low-calorie options, some of which are considered natural, such as those based on stevia plant leaf extracts. Acceptance of the proposed rule will make it easier for milk processors to blend nutritive and non-nutritive sweeteners to create flavored milks with less sugar and fewer calories. To read more about using stevia to sweeten flavored milk, read HERE. 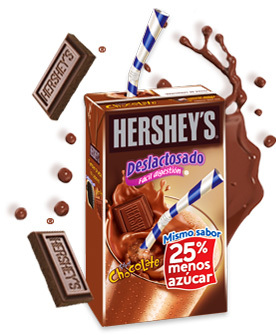 In Mexico, Hershey’s recently reformulated its ultra-pasteurized aseptic line of flavored milks to contain 25% less sugar than the original product. This low-fat milk line comes in four varieties: Chocolate, Cookies ‘N’ Cream, Strawberry and something not very common, Lactose-Free Chocolate. All varieties are enriched with “Vita 6,” a proprietary blend of six minerals and vitamins, including calcium, zinc and vitamins A, B1, B2 and E. Each 236-milliliter box contains 128 to 151 calories, depending on variety. Calories are kept low through an innovative mixture of caloric and non-caloric sweeteners, one of which is stevia. LaLa also has a reduced-sugar, low-fat flavored aseptic milk line in Mexico that relies on stevia to keep calories low. Available in Chocolate, Strawberry and Vanilla flavors, the milk comes in 250-milliliter single-serve boxes sold in packs of three, as well as a one-liter multi-serve recloseable box. The milks are enhanced with vitamins A, D, B5, B12 and folic acid. There are definitely pros and cons to the petition, and I would say at this point it has a 50-50 chance of being accepted. Even with that uncertainty, milk processors should be exploring ingredient technologies to lower the sugar content of their flavored milk. Dairy Council of California recently held its 14th Functional Foods Task Force meeting. The task force is a group convened annually to track changes in the external environment that affect the dairy industry. This 15-member group, which I proudly am a member and have been since the beginning, is composed of industry experts from around the country, representing research and development, academia, marketing, education and communications. Discussions ensue around nutrition and dairy research, public policy, regulations and consumer perceptions that impact dairy. Strategies are outlined that Dairy Council of California and the industry can pursue to optimize dairy’s positioning in a rapidly changing environment. 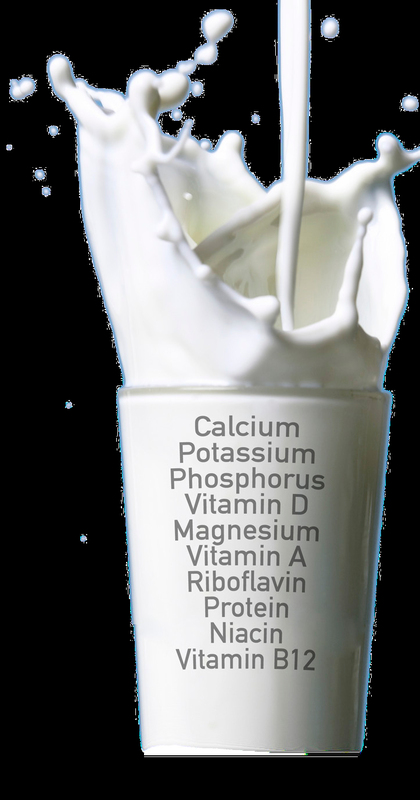 Label products and educate consumers about milk’s nutrients beyond calcium. Emphasize that dairy foods belong in well-balanced vegetarian diets. Consider technology applications and venues to reach adolescent and young adult consumers. Continue to develop and market products to specific segments of the population. Maintain the market hold on dairy as the perfect carrier for prebiotics and probiotics. Develop messages around the satiety effects of dairy products. Support research on dairy’s role in preventing diabetes and metabolic syndrome. Support research on bioactive milk protein, oligosaccharides and other dairy components. To minimize industry-funded research bias, register trials appropriately when funding research and insist on rigorous study designs. Use third-party experts to increase credibility. 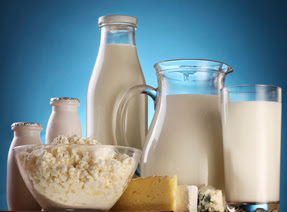 To read the complete summary of the Dairy Council of California’s 14th Functional Foods Task Force meeting, visit HERE. Most Daily Dose of Dairy™ readers are involved in the development and marketing of one or two dairy product categories. Common combinations are cheese and whey, milk and ice cream, and yogurt and dips. But we all recognize the contributions each product category makes to the overall healthful halo that dairy products possess. It is important that we occasionally do a “check in” to make sure we have not lost focus of our purpose, which should be to offer consumers the best-tasting, most nutritious, affordable and sustainable dairy products. 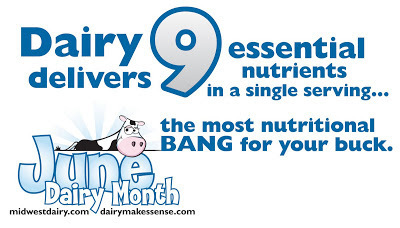 For long, dairy has been recognized for its nurturing and nourishing qualities. With this being Mother’s Day weekend, it is perfect timing to share this video from the Global Dairy Platform (GDP). It is less than 2.5 minutes and does a fabulous job reaffirming dairy’s role in life. Established in 2006, GDP’s mission is to align and support the dairy industry to promote sustainable dairy nutrition. For more information, visit HERE. DAIRY PROTEIN: THE GOLD STANDARD. With a groundbreaking report by an Expert Consultation of the Food and Agriculture Organization of United Nations (FAO) recommending a new, advanced method for assessing the quality of dietary proteins, GDP hosted a Protein Marketing Workshop for its members to prepare and position the dairy industry to benefit from this new information. The new method—the Digestible Indispensable Amino Acid Score (DIAAS)--enables researchers to differentiate protein sources by their ability to supply amino acids for use by the body. The new method demonstrates the higher bioavailability of dairy proteins when compared to plant-based protein sources. Data in the FAO report shows whole milk powder to have a DIAAS score of 1.22, far superior to the DIAAS score of 0.64 for peas and 0.40 for wheat. When compared to the highest refined soy isolate, dairy protein DIAAS scores were 10% to 30% higher. GDP is working in collaboration with its members to develop a strategy to communicate dairy protein’s superiority. For more information on the FAO report, view HERE. CHANGING THE CHEESE PARADIGM. GDP initiated a Wageningen University (Netherlands) meta-analysis of completed human clinical studies to evaluate the effects of cheese consumption on blood cholesterol levels from published clinical trials. Additionally, work on a series of animal studies and human clinical trials on the effects of cheese fat content and maturation continues to progress at the University of Copenhagen. The outcome from this research is poised to show that moderate cheese consumption does not have a negative impact on heart health. Building on that effort, GDP serves as the secretariat to the Dairy Research Consortium (DRC), an alliance among six leading dairy industry associations that collaborates on pre-competitive research into the nutritional and health benefits of dairy. In April 2013, the DRC agreed to investigate the beneficial health outcomes related to the consumption of full-fat (whole milk) dairy products. This is just a “skimmed” part of the “whole” story. There is so much more we are learning every day about this great food known as milk. According to GDP, the key for dairy at this moment in its history is not to invent a new story about ourselves, but to understand where our story has taken us, how it might further unfold, and what threads unify the tale. Even though all M&Ms taste the same, many of us will select a specific color when given the option. Psychologists say that color choice has a subconscious meaning and is a reflection of our personality. Regardless if you agree or not, one thing I am sure we can all agree on is that colorful food has eye appeal. In fact, numerous studies have shown that color cues for flavor. This is one of a number of reasons formulators have long added color additives to foods and beverages, including dairy. Other reasons include correcting natural variations in the actual color of certain ingredients and ensuring color during processing and storage. Here’s the deal on adding color to foods in 2013…and beyond. It’s all about using color additives referred to as “exempt from certification,” or more casually, “natural colors.” In fact, an increasing number of dairy processors are replacing artificial colors with natural ones because of the negative publicity surrounding artificial colors. Artificial colors have been the cause of controversy since the 1970s, when a pediatrician first identified a correlation of intake to children’s behavior. They came under fierce scrutiny again in September 2007 after the results of a British study from the University of Southampton in the United Kingdom showed a correlation between artificial food colors and additives and exacerbated hyperactive behavior in children. Referred to as the “Southampton Six,” the colors singled out for a connection to hyperactivity in children include these three synthetics approved for use in the States: Alurra Red (FD&C 40), Tartrazine (FD&C 5) and Sunset Yellow (FD&C 6). The other three of the Southampton Six--Ponceau 4R, Quinoline Yellow and Carmoisine--have long been banned by FDA. Color suppliers offer an array of natural replacements for the Southampton Six, as well as the other FD&C colors used in the States. (See table.) Often times a natural substitute requires careful blending of exempt-from-certification colors, as well as some minor process and formulation modifications…but it can be done! And consumer studies show that phrases such as “contains no artificial colors” or “contains no additives” appeal to a growing number of consumers. 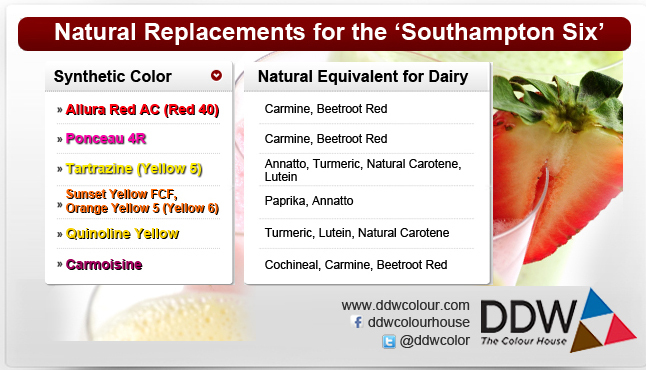 Many dairy processors, in particular cheesemakers, have long used natural colors to liven up their products. Most cheeses are naturally the color of milk (which can be very boring) unless they include microorganisms that contribute color. An example is the mold Penicillium glaucum, which creates blue veins in gorgonzola. Cheesemakers often add the carotenoid annatto to cheese—natural, processed and even sauces—to give it that cheesy orange color consumers, for some reason, have come to expect in their cheese. Annatto has come a long way since that first graduated cylinder of annatto was poured into a vat of milk being cooked and on its way to becoming cheddar curd. Organic versions of annatto are now available, even in water-soluble powder form, for inclusion in cheese sauce mixes and toppings. Many natural colors are available in organic formats. Natural colors can also be designed to be oil soluble, which has long been a challenge with using natural colors in higher-fat dairy foods, such as cream cheese, dips and spreads. Today, naturally derived, oil-dispersible hues are available in colors such as brown, yellow, red, orange and even pink. There are so many natural coloring tricks available. What’s holding you back? Look who has gone natural. Unilever has been marketing Fruttare frozen novelty bars in various markets around the world for some time and finally decided to make the bars available in the States. Fruttare is composed of two different product lines. Fruit and Milk bars come in Banana, Coconut, Peach and Strawberry flavors. 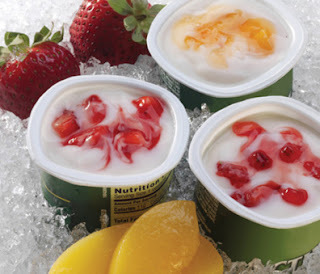 Fruttare Fruit and Juice Bars come in Lime, Mango, Orange and Strawberry flavors. Three of the Fruit and Milk varieties use coloring to help better convey their flavor. Strawberry relies on beet juice concentrate and turmeric oleoresin; banana uses turmeric oleoresin and annatto extract; and peach includes annatto. For more information, visit HERE. As the only U.S. yogurt manufacturer to include vegetables in the variegate component of kids’ cup yogurt, Stonyfield shows us you can drink this great dairy + produce combo, too. 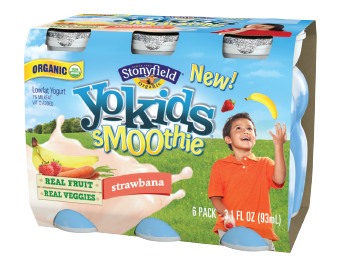 New YoKids Smoothies start with a base of organic low-fat yogurt and blend in organic fruit and vegetable purees. and strawberry purees, along with carrot juice concentrate. 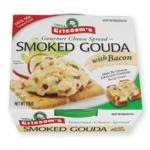 The cheese used to make new Mrs. Grissom’s Gourmet Smoked Gouda with Bacon Cheese Spread uses apo-carotenal to achieve its desirable cheesy hue. For more information, visit HERE. Dean Foods’ TruMoo Strawberry flavored milk uses beet juice powder to enhance the strawberry color. 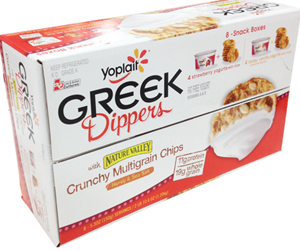 New Yoplait Greek Dippers with Nature Valley Crunchy Multigrain Chips consist of strawberry yogurt with honey and sea salt-flavored chips and honey vanilla yogurt with honey and sea salt-flavored chips. The strawberry variety declares on the ingredient statement that vegetable juice is used for color. Stay tuned for more on this product when it is featured as a Daily Dose of Dairy.